What do you do after noshing on a variety of savory appetizers, dips, and finger foods? 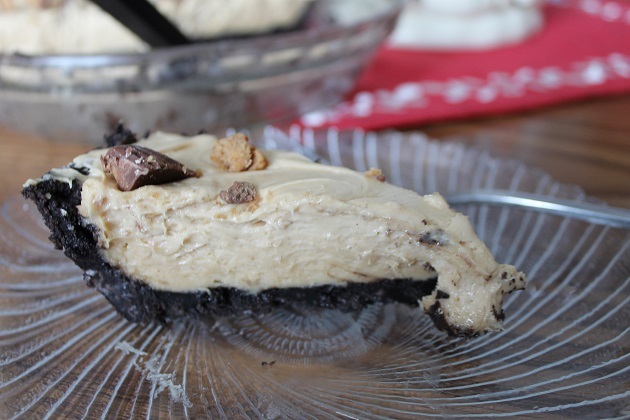 You balance it out with a slice of creamy peanut butter pie (aka ” Rule of 1 pie” at my house). You don’t think about the calories and you most definitely don’t glimpse at the pedometer you’re wearing that is grossly under the recommended daily steps because tomorrow is another day in which you can hit the treadmill with vim and vigor. This recipe can’t be any easier as it calls for 1 of every ingredient and there are only 6. It’s an easy list to store to memory and a great dessert to make when you’re short on time. When using a purchased pie crust it’s pretty much effortless. Then again, crushing a bag of Oreos or any other chocolate sandwich cookie can be considered exercise, right? Sure. Beat one 8 oz. package of cream cheese, 1 cup of powdered sugar and one container of whipped topping until creamy. 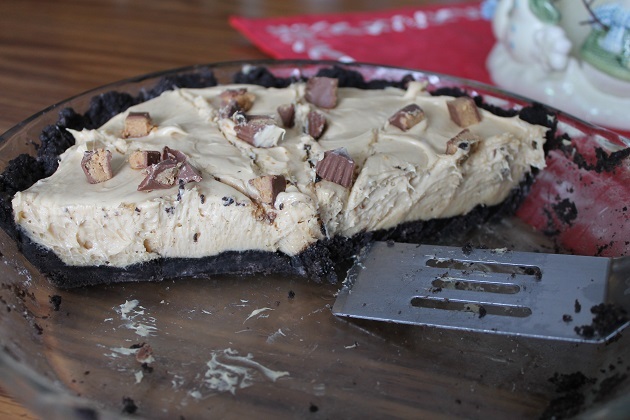 Pour into chocolate pie crust and top with one package of peanut butter cups, chopped. 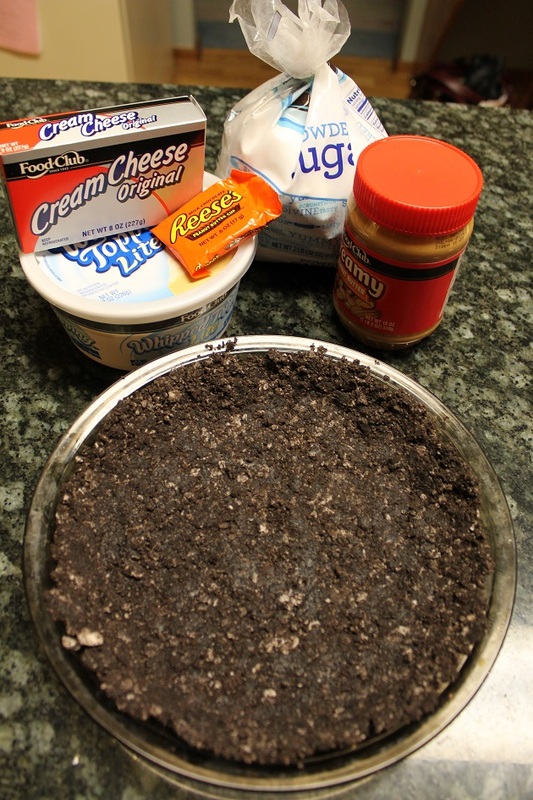 Refrigerate at least 2 hours and then dig into a decadent slice of heaven aka Rule of 1 Peanut Butter Pie. Wishing you a New Year filled with many sweet moments! Enjoy! Beat cream cheese and peanut butter until smooth. Add powdered sugar and whipped topping and mix until thoroughly combined and creamy. Pour into pie crust and top with chopped peanut butter cups. 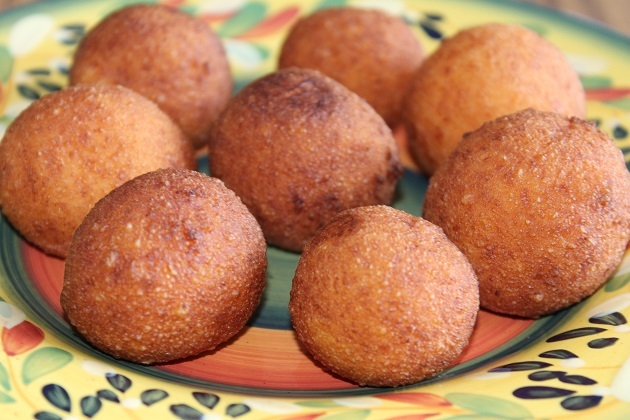 It’s December 24th and I’m posting a recipe for traditional Colombian Christmas cheese fritters, called buñuelos. Untimely? A little behind the eight ball? Scrooge-like? Nope, nope and nope. Folks will be ’tis-ing the season for the next week and these yummy puff balls will make an especially nummy nosh for New Year’s. These cheese fritters are a delightful aperitif and believe me when I say they pair deliciously with my new-found favorite blended wine, called “Mixed Up.” And besides, my fellow Orthodox Christians and I have another 13 days until Christmas so in that regard this post is actually early. The month of December is busy, busy, busy — primarily in a good way. However, the timing of my family discovering these delicious cheese fritters was just plain awful. Hunky Hubby and I played role reversal last week and while I was off to work he used some extra vacation days to stay home and do the final preparations before our slava. Trying new recipes and making old favorites, cleaning and tidying and erranding and…making Colombian cheese fritters. That last to-do was sprung on him when eldest Beauty announced that she needed to bring in a traditional Colombian Christmas food to AP Spanish the day after slava. Gotta love it. There should be a ban on such teacher directives as parents almost always get sucked in. Though the timing was terrible, our family is happy to add Colombian cheese fritters to our foodie experiences. These cheese fritters are actually easy to make (according to my Love), are not greasy, and can be made in advanced and heated for a few seconds in the microwave. We prefer them as a savoy treat sans the traditional Nutella topping or dipping into hot chocolate. As I’m nestled on the sofa while writing this post I am thankful for this quiet night and hope all of you who are celebrating are doing so with reverent and joyful hearts! In a large mixing bowl, combine grated cheese, cornstarch, sugar and baking soda. Stir in the whole egg and egg yolk and mix well. If the dough seems dry, add a bit of milk one tablespoon at a time until you get a smooth dough. Measure 1 tablespoon of dough and shape into individual balls. In a large pot, heat the oil over medium-high heat to 375F. Working in batches, fry the fritters a few at a time -- no more than 5 or 6-- until golden (about 5 minutes). The fritters will sink to the bottom at first and then rise to the surface after a minute or so. Transfer to a plate lined with paper towels to drain. Hey there! 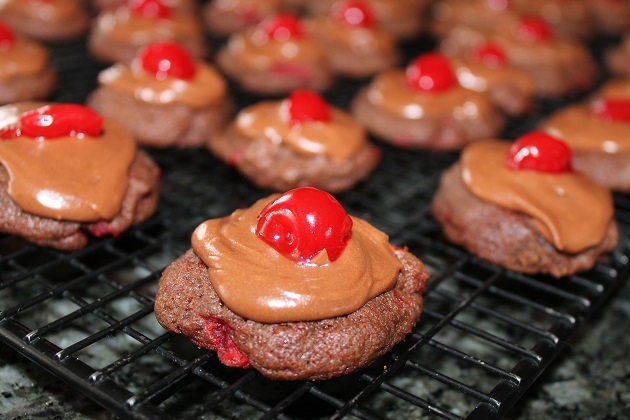 So happy to be back to my blog and share this recipe for Double Chocolate Cherry Cookies with you. If you love the taste of cherry and chocolate, you’ll love these drop cookies. A tender chocolate base filled with mini chocolate chips and bits of maraschino cherries is topped with a creamy chocolate frosting. These double chocolate cherry drop cookies come by way of an old Land O Lakes cookbook that I bought in the early ’90s. They’re a pretty addition to an assorted cookie tray, freeze well, and a plate of these are a much appreciated gift. Combine butter and both sugars in a large mixing bowl and beat until creamy. Add egg and extract and continue beating until well mixed. Reduce speed and add flour, cocoa, and baking soda. Beat until well mixed. Stir in chocolate chips and chopped maraschino cherries by hand. 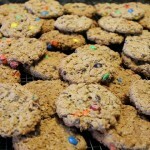 Drop by level tablespoonfuls onto ungreased cookie sheets. NOTE: these cookies spread. Bake 12-14 minutes or until set. Cool completely. To prepare frosting, melt chocolate and 2 tablespoons of butter in a small saucepan over medium-low heat, stirring until smooth. Combine chocolate mixture and powdered sugar. Stir in evaporated milk and reserved cherry juice until smooth. Frost cooled cookies and place cherry half in the center. Let stand until set. It’s been three weeks of decking the halls, getting into the holiday spirit with the band’s Sounds of the Season concert, and doing plenty of cooking and baking, and hosting dear family and friends – especially this past Thursday when we celebrated St. Nicholas Day. December 19th by the Julian Calendar is St. Nicholas Day and my family’s patron saint day (also referred to as our Slava). Honoring one’s patron saint is unique to Serbian Orthodox Christians and signifies the birthday our ancestor’s entry into the Church. St. Nicholas falls during the Nativity Fast, which equates to following a vegan diet and abstaining meat, eggs, and dairy. Hosting both Orthodox and friends of other faiths, I serve both vegan and non-vegan foods. 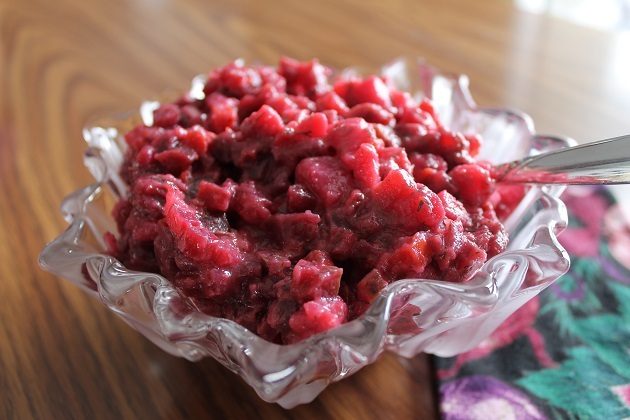 Between now and my Christmas (January 7th), I’ll be posting a different holiday recipe as a way of sharing my table with you. I hope you enjoyed a bountiful and beautiful Thanksgiving! 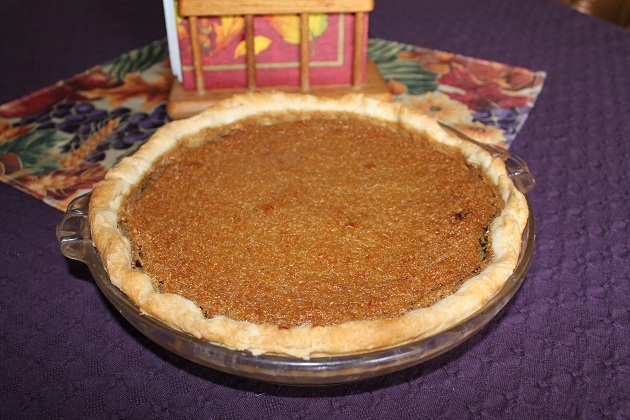 It might seem odd that I’m posting this recipe for pumpkin sweet potato pie after Thanksgiving but there’s good reason with a side of good lesson on being thankful – even for our shortcomings. Wednesday evening as I was preparing my traditional homemade fresh pumpkin pie I discovered that I was short on puree. Of course, I didn’t roast the pumpkin in advance. No, no. I was in what I call “ram mode” and going at it start to finish with no time to waste. After all, my beautiful niece was home from college and over for the evening and there were games to be played, chit chat to catch up on, and a movie to watch like old times. As I began preparing the pie filling I came to realize that I am a poor pumpkin judger. I am not at the caliber of those who can eye a fresh pie pumpkin and estimate to near exactness the quantity of yummy puree said pumpkin will produce. Nope, not me. I had two fresh pumpkins in the garage and I consciously choose the small one thinking it would be the perfect size. Well, let me say that I am thankful for that lack of pumpking judging talent because had I not been short on puree I would not have produced this recipe for pumpkin sweet potato pie by default. The best sweet potato pie I have ever devoured is from the one and only Fat Matt’s Rib Shack in Georgia. When it comes to pumpkin pie, however, there are quite a few that I can rave about. And my own isn’t too shabby either, if I do say so myself, thanks in part to the delightful recipe in the Southern Living Cookbook. But this pie. This pumpkin sweet potato pie is something to tweet about. It’s a delicious marriage of two wonderful pie flavors combined into one. It’s the best, sweet, hasty creation by default that I have ever made. If you don’t enjoy this pie post Thanksgiving this year, by all means bookmark this page or print it and file a hard copy where you’ll find it next year. And then let me know how you like it. Combine pumpkin, sweet potato, brown sugar, butter and egg yolks in a large mixing bowl and beat until light and fluffy. Add spices and evaporated milk and stir until combined. In another bowl, beat egg whites until they are just starting to stiffen. Add the tablespoon of sugar and beat until stiff peaks form. Fold egg whites into pumpkin/potato mixture. Pour filling into pie shell and back at 400F for 10 minutes; reduce oven temperature to 350F and bake an additional 45-50 minutes or until set. I had always been of the mindset that there should be no decking the halls before Thanksgiving and that ban included fa-la-la-ing. 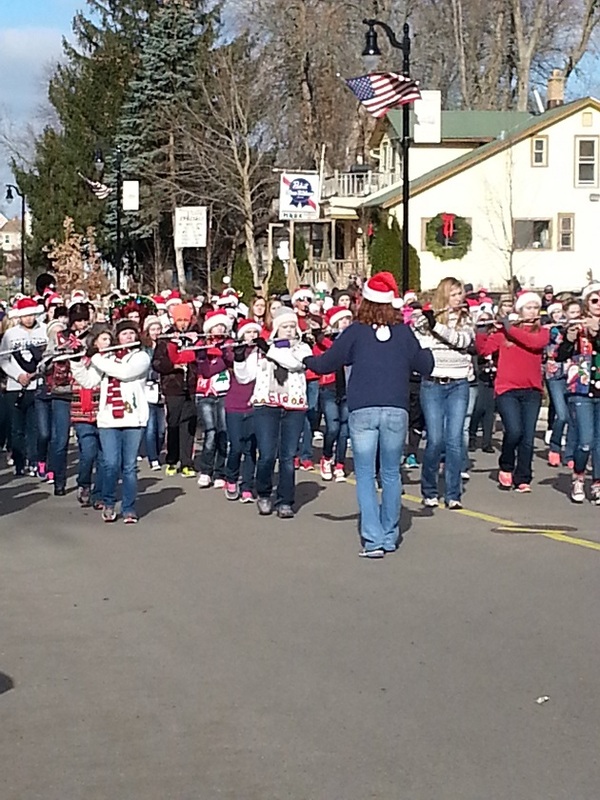 As a die hard band mom, I had to eat my words today because there was no way that I was not going to freeze my tush in low 20 degree weather and cheer them on during our city’s Christmas parade. No siree. I pulled on a fuzzy Santa hat, burrowed my nose in my jacked, and enjoyed every note those 270 kids played. Who, by the way, appeared to have bought Goodwill out of every ugly Christmas sweater in the metropolitan area. The photo above does not capture some of the fashion highlights that included a lead trumpeter doubling as an elf complete with bright green leotards or the bearded Junior playing a snare drum and wearing a ladies cardigan sweater with two large white cats adorning each side pocket. The winner, however, was a young clarinetist who donned a large, ornate sombrero with bright red bulb ornaments dangling around the perimeter. The sun was shining brightly and the wind was frigid but I relished every moment. Last week was the jazz concert and I had a heavy heart sitting in the audience knowing there’s only one jazz concert left before the end of the school year and my Senior will be moving on in life. I was relieved to hear other parents sharing the same sentiments and blinking quickly to stop any forming waterworks. Cheesy? Yeah, I know. Enough nostalgia and on to sweets! As I may have mentioned, I enjoy baking for the band. For this latest concert donation I decided to bake an oldie but goodie recipe from the very first cookbook I received. You know, the red and white plaid binder. The one and only Better Homes and Garden’s New Cook Book circa 1989. 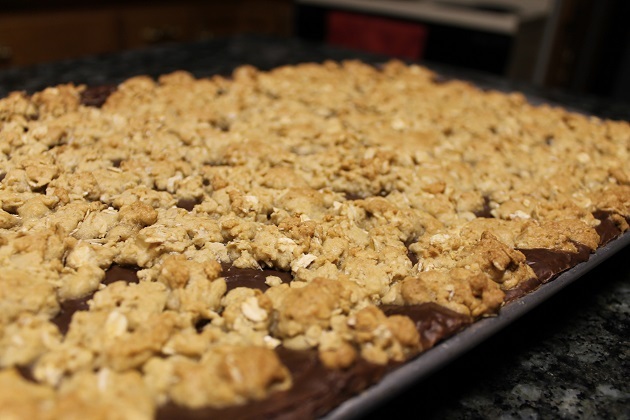 Chocolate revel bars are a sturdy cookie. A hearty oatmeal base with a gooey chocolate center made from semisweet chocolate, butter, and sweetened condensed milk, and then topped with more oatmeal cookie crumbles. 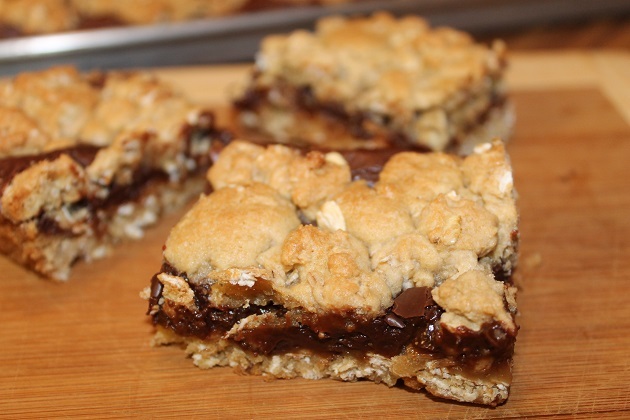 If you’re looking for a bar cookie that’s not overly sweet, chocolate revel bars are a winner. The freeze well, feed a crowd, and lend themselves to variation such as the addition of peanut butter in the cookie base or swapping butterscotch chips for semisweet in the filling. There are many possibilities all of which are sure to add a sweet note to any occasion. Add about half of the flour, the brown sugar, baking soda, eggs and 2 teaspoons of the vanilla and beat well. Add remaining flour and oats and mix until combined. In a medium saucepan, combine chocolate chips, sweetened condensed milk, 2 tablespoons butter or margarine and the remaining 2 teaspoons of vanilla. Cook over low heat until smooth. Measure our 3⅓ cups of the oatmeal cookie mixture and press into the bottom of a 15x10-inch cookie sheet pan. Spread melted chocolate mixture over the top and dot the remaining cookie mixture on top of the chocolate. Bake at 350F for 25 minutes or until lightly browned. This a soup that screams winter! Or fallish-winter, which is what we had today in southeastern Wisconsin. Our first surprise snowfall was just enough to provide a sheer blanket of white, a not-so-subtle reminder that winter will be here before we know it. 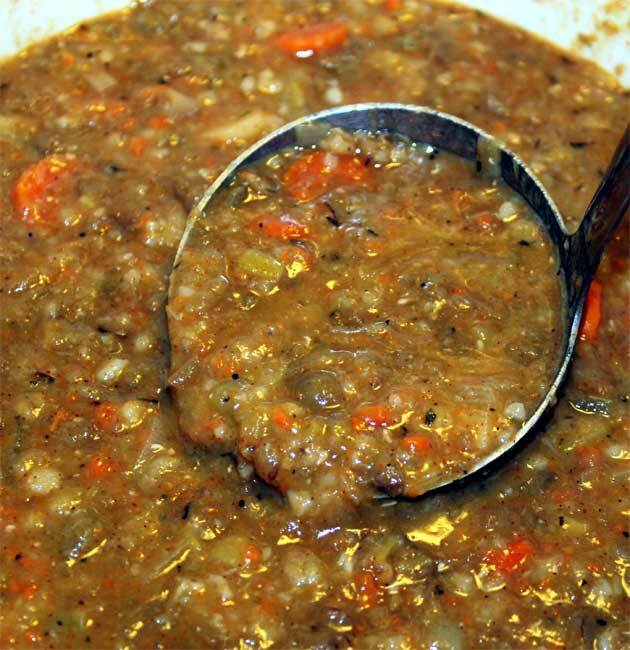 And there’s nothing better than a bowlful of thick, stick-to-your-ribs vegan lentil-barley soup to warm your insides like a toasty blanket as the temperature drops. Don’t care for lentils, you say? Give them another chance. 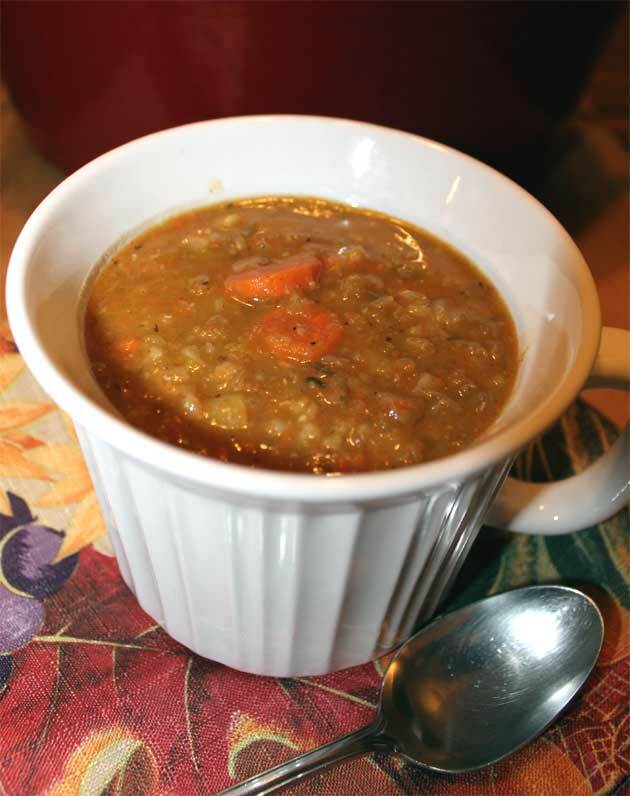 Vegan lentil-barley soup is comforting, richly flavorful and so delicious that you’ll forget all about your disdain and become a converted lentil lover. Lentils are full of fiber and readily take on the flavor of whatever they are cooked with. Leek, carrot, celery, and parsnip pair nicely with this powerhouse legume and three quarters of a cup of beer adds to the richly flavored broth. Barley adds another layer of substance and together with thyme, bay leaves, and good quality vegetable broth you have one stellar soup. Organic vegetable broth makes this lentil-barley soup vegan but I’m sure the soup would be equally delicious with reduced sodium chicken broth. I based my version of vegan lentil-barley soup on the November 2010 Lentil-Barley Soup recipe in Cooking Light, omitting celery leaves and dill, and reducing the chopped celery by half. 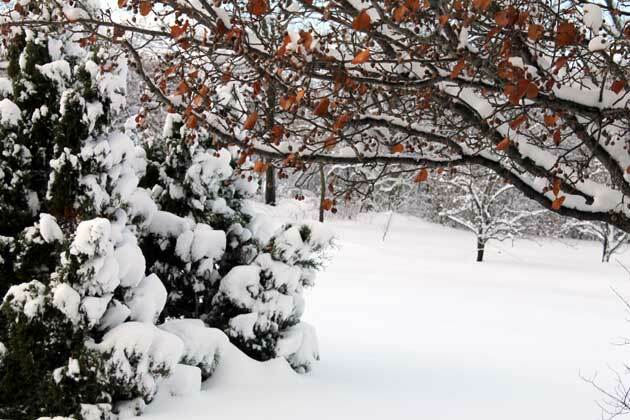 I wonder if this early snow fall is a sign that we’ll be lambasted this winter – the ardent wish of my resident outdoor enthusiasts (aka Hunky Hubby and youngest Beauty) who are anxious to tackle a few black diamonds. Normally, I’d say bring on the snow and a part of me is still hoping for a good old fashioned winter as my Gramz used to say. Now that my commute is miles longer than a short walk down the hallway I’m not as enthusiastic as I used to be. But the call for cold and snow is a call for soup and that’s perfectly fine by me. Enjoy! Heat oil in a Dutch oven and saute leek for 2 minutes. Add broth and beer and bring to a boil. Cover the pot, reduce heat and simmer for 15-20 minutes or until carrots and parsnip are tender. Cover and cook 30 minutes or until tender. Pour blended soup back into the pot, stir in salt and return to a boil. Cover, reduce heat and simmer for another 10 minutes, stirring occasionally. Prepare to feast your eyes on the feast I savored for dinner. 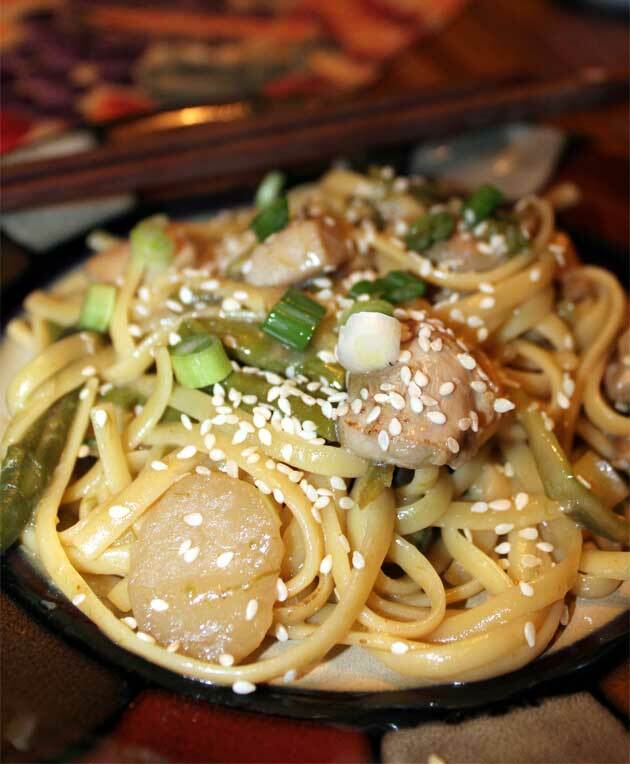 A five-course fusion of Asian cuisine prepared by my loving Hunky Hubby just because. Not for a birthday or anniversary celebration, just an ordinary Thursday night that became extraordinary. Really, how many guys would spend a good portion of their day off willingly cooking, baking and getting dish pan hands? Makes me love my Love all the more, even with his awful no-shave-November goatee. 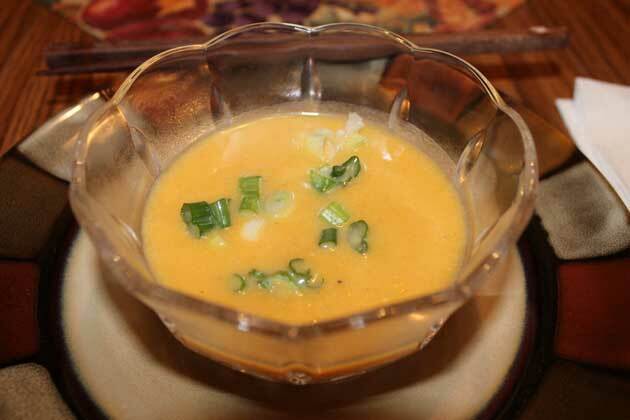 Our first course was a delightful bowl of Thai butternut squash soup. Tummy warming and taste bud tantalizing is the best way to sum it up. The original recipe, courtesy of food.com, calls for a 13.5 ounce can of coconut milk. Ours purportedly went bad, but I can attest to the deliciousness of Hubby’s substitution: 1 tablespoon of coconut oil mixed with 1 1/2 cups of skim milk. Also, for non-curry lovers like yours truly, 1 teaspoon of Rogan Josh is a tasty substitute for 1 teaspoon of curry powder. In a heavy pot, heat oil and cook onion until soft. Add stock, squash and Rogan Josh and bring to boil. Cover and simmer until the squash is tender. Stir in the coconut oil and skim milk. Process with hand blender until smooth. Return to pot and stir in black pepper. 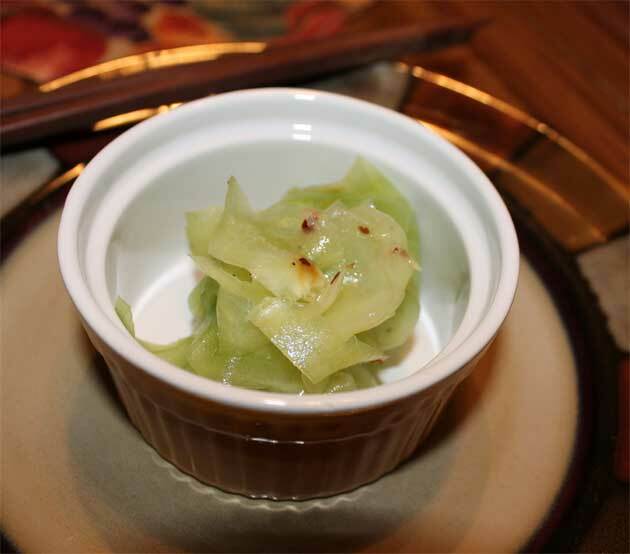 To serve, top with chopped green onion. 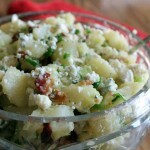 Serves 4 appetizer-sized portions or 2 dinner portions. 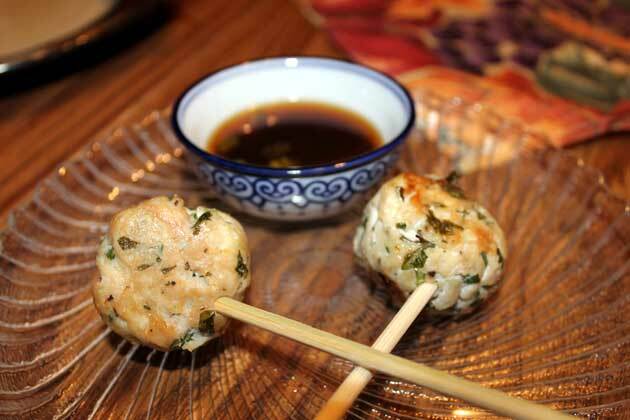 Vietnamese Meatball Lollipops with Dipping Sauce was our next course. Who doesn’t like eating anything from a stick let alone meatballs? This recipe was from bettycrocker.com, with one exception: the dipping sauce. I can’t give you a recipe because, as in true foodie fashion, it was a little-this-and-that creation that Hubby whipped up. His version was much lower in sodium and had a drop of Siracha gave a nice kick. I was told we were having a salad-less salad course but what with being in a fog from a 10 hour day it never occurred to me that we’d be enjoying an Asian cucumber salad. Especially one that looked like a flower and tasted spicy and delicate at the same time. To make this delight, simply peel the cucumber and after discarding the skins keep peeling – in essence you’re creating cucumber shavings. For a serving of four, use 1 1/2 cucumbers. Prepare a simple dressing by mixing a splash of rice wine vinegar, crushed red pepper to desired heat, a bit of freshly grated ginger (again, to taste) and salt to taste (careful with the shaker). Let the cucumbers marinade for several hours. Arrange the shavings in twists to resemble a flower when you’re ready to serve. This salad is so light and refreshing I could eat the entire bowlful by myself! Our fourth course and entree was a sesame topped stir fry with vegetables and chicken in a light Asian sauce. I gave up on the chopsticks and dove in with a fork. Sorry, folks – no recipe. Hubby created as he cooked and ooh I just love it when he does that. And now, for the sweet finale: Bibingka. 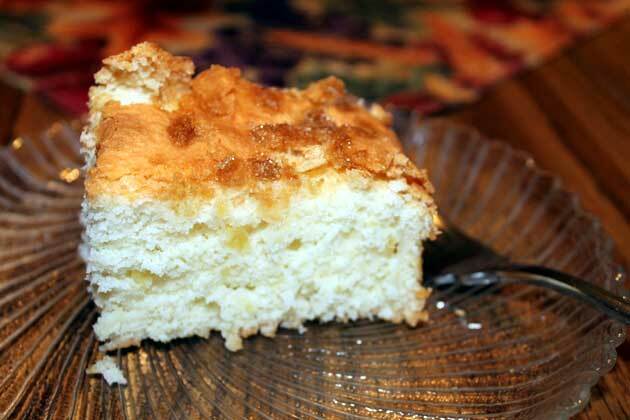 This Filipino coconut cake tastes like a cross between angel food cake and a pineapple-coconut flavored pound cake. A perfect ending to such a special meal. It was one of those nights when my heart swelled with gratitude as I cherished family time and all the love that my Hubby put into every bite. 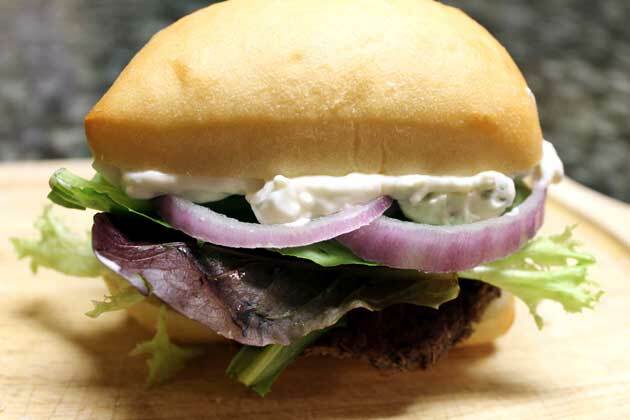 This recipe for oven roasted beef tenderloin sliders is brought to you in part by a great supermarket sale and my craving for blue cheese. Tenderloin is not a cut of beef that makes its way to my family dinner table very often so it was an EXTRA special supper – worthy of the all caps shout out. Next to the stupendous taste, the next best thing about this recipe for is the workload: it’s next to nothing. 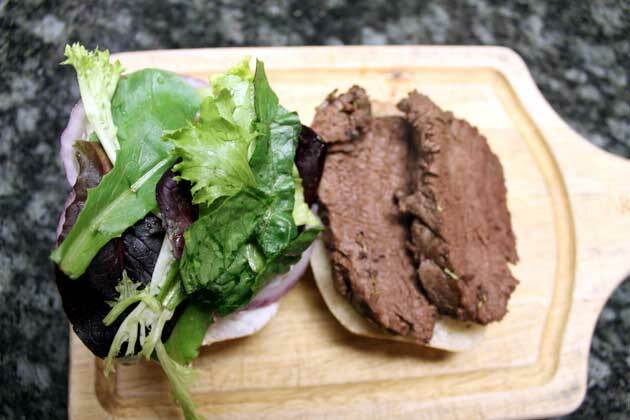 Oven roasted tenderloin sliders is a sloth-like recipe. The greatest effort that one will need to put forth is mixing: mixing the herb rub for the beef and mixing the aioli ingredients. I suppose washing mescalin greens and slicing red onions and slicing rolls is technically prep work but as you can deduce, it’s not laborious. The only sweat you’ll break is opening the oven door and feeling the heat. Pair these sliders with a healthy cup of soup and you have a meal that not only fits the bill for busy weeknights but one to go to for casual entertaining year round. This weekend I was reminded that we never know when God will call us home. Whether it’s surprising your family with a splurge, meeting up with a friend or bestowing a random act of kindness on a complete stranger, relish every moment with a grateful heart. 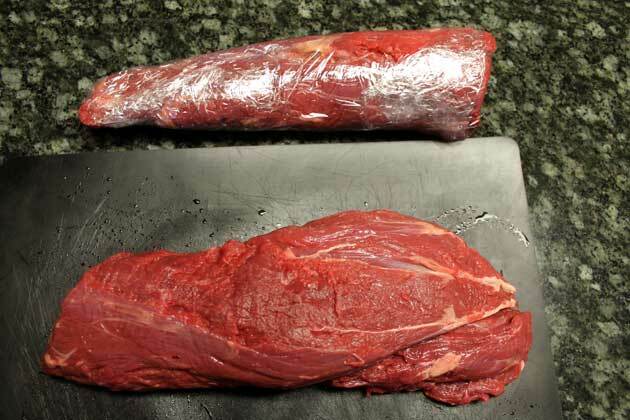 Place tenderloin on baking sheet. 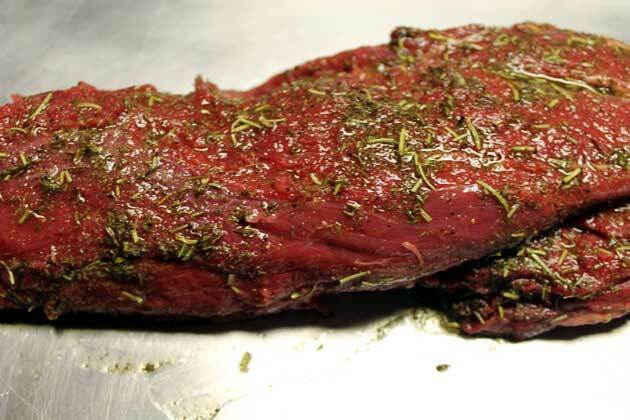 Combine first 6 ingredients in a small bowl and pour over the top of the tenderloin. Roast for 30-35 minutes. Let rest 10 minutes before slicing. Hey all! It has been quite a week. Actually two weeks. After a decade of working from home as a self-employed SEO/SEM professional, I re-entered the corporate world in a new realm: higher education. Doing good work for my clients has always been and continues to be very gratifying but being part of an organization that impacts people’s lives in a profound way is gratification to the nth degree. My first two weeks have been a whirlwind of people and information. A combination of equal parts stress and exhilaration. Call me an enigma, a paradox, an odd ball, but I find that I have become more organized than I have ever been. I’m finding ways to minimize task time to optimize family time and I’m also embracing my foodie in a new way. I’ll be sharing that with you and passing the relish beginning with this recipe for vegan roasted red pepper soup. 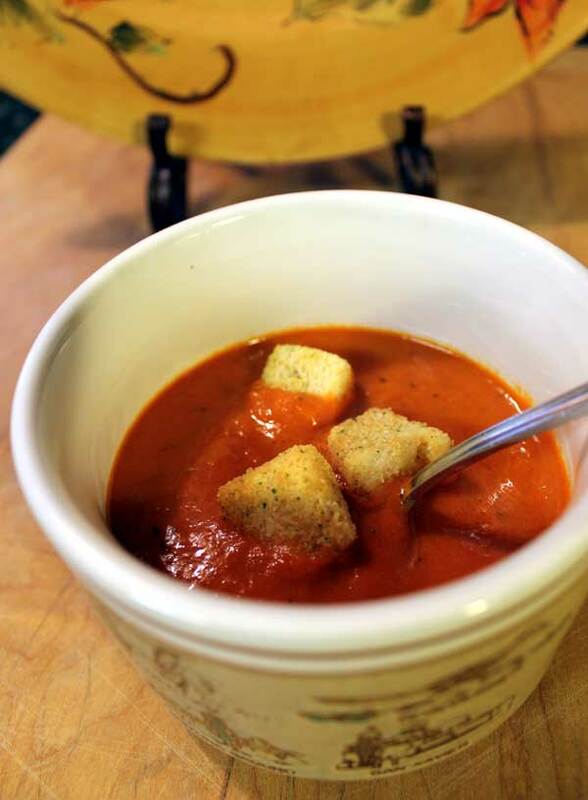 Next to opening a can or pouring soup from a carton, vegan roasted red pepper soup is by and large the quickest and easiest soup there is to prepare. As for taste, it’s over the moon deeeelicious. As for health benefits, red peppers are loaded in antioxidants, beta-carotene, vitamins A, C, K, and B6, and plenty of phytochemicals. All of that in a pepper! Tip #1: Roast red peppers in bulk to do the work once and to have roasted peppers at the ready for many tasty uses. I try to grill a bushel every fall but you can easily roast peppers in the oven. To oven roast, place whole (washed) peppers on a baking sheet and broil until the skins are wrinkly and charred (turn the peppers to ensure even roasting); remove the pan from the oven and cover with aluminum foil or place in a paper bag and seal until the peppers are cool. Peel the skins, remove the core and seeds, and place roasted pepper strips in air tight freezer bags. 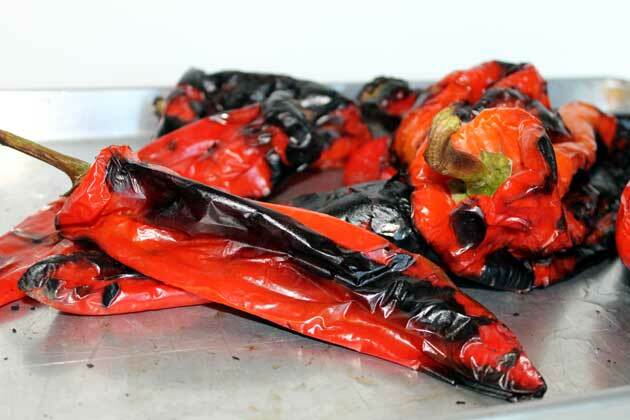 Whether you grill or oven roast, the process of roasting red peppers is worth the time. You’ll enjoy the fruits of your labor for months to come both figuratively and literally (yep, peppers are a fruit). Moreover, you’ll have plain ol’ roasted red peppers and not oil-packed peppers as those sold commercially. For a speedy supper, thaw 6 peppers and cook with finely chopped onion or shallot, a generous dash of thyme and broth. Use a good quality vegetable broth to keep the soup vegan (my favorite is Trader Joe’s), but know that this soup is just as tasty when prepared with low sodium chicken broth. Blend until smooth and whisk in 1/4 cup soy or reduced fat milk. Richly colored, deeply flavored and incredibly satisfying, vegan roasted red pepper soup is ready in under 30 minutes. Now that’s my kind of healthy weeknight dinner! Enjoy! Heat tablespoon of oil in a heavy saucepan and cook onion/shallot until soft. Add chopped roasted red bell peppers and 1½ cups of broth and cook until peppers are very soft - about 15-20 minutes. Using a standard blender, puree in batches or use a hand blender and blend until smooth. Add remaining ½ cup of broth and milk; season to taste.